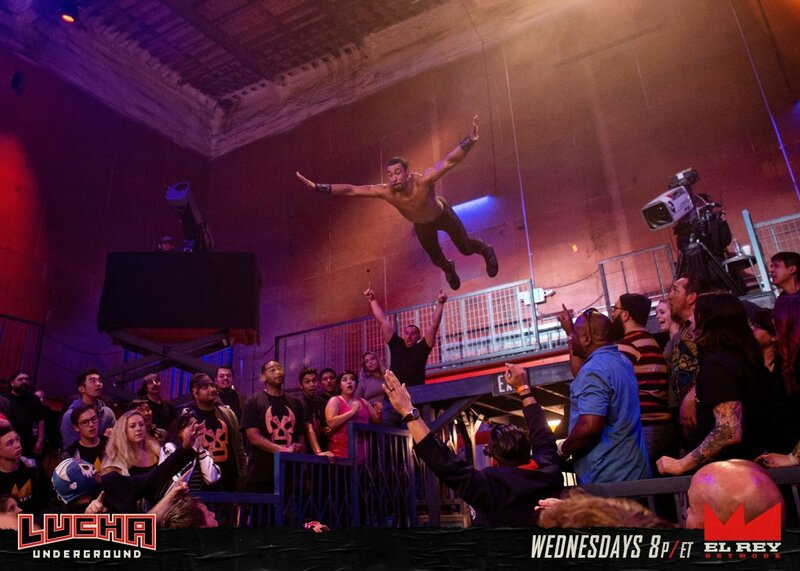 Next week, Lucha Underground holds Ultima Lucha Cuatro, but before then, a new Gift of the Gods Champion was crowned in a good match that saw Jake Strong defeat six other men. Also, the power gauntlet made its return and fell into the hands of a surprising person. The show opened with action, jumping right into the Seven to Survive match. Fox opened the match by taking everyone out with various strikes and dives. Fox hit a springboard inverted flip dive onto everyone, crashing to the floor. Fox flew into Hernandez, but Hernandez caught him and went for a fallaway slam. Hernandez used his power to keep Fox grounded. As Hernandez went for a crucifix bomb, Fox floated over and got a backslide that pinned him! Hernandez has been eliminated by Dante Fox. The other five men rushed the ring and beat on Fox together. The match broke down as Cuerno hit a fireman’s carry slam on Aerostar into some chairs. Strong was brawling with Fox, and Strong caught him when he went for a hurricanrana and powerbombed him into a wall. Meanwhile, Famous B gave Steve a wrench and he beat on people with it for a bit. PJ Black cut him off with a low blow. Strong and Black went for each other, seeing Black get a few near falls, but Strong rolled through a sunset flip and locked on the ankle lock before breaking Black’s ankle. PJ Black has been eliminated by Jake Strong. Strong and Steve brawled in the ring as the crowd chanted for them. Cuerno took out Strong, and Fox went after Steve, but Steve suplexed him into the mat. Steve and Cuerno beat on Aerostar to boos from the crowd, and Steve hit a pop-up cutter. Steve and Cuerno exchanged blows, with Cuerno nailing him with a knee. Both went down with a double clothesline. Drago came out with a forklift, dressed in full construction gear (with horns on the protective helmet), and Aerostar was lifted to the ceiling before diving off into the ring with a plancha onto Steve and Cuerno! That was incredible. Aerostar pinned Steve, and now Famous B’s man has been eliminated. Strong took advantage of Aerostar being hurt and started to use power moves to keep him grounded. After an exchange of holds with Cuerno, Aerostar was back in the match, but Strong caught him and got him to tap out with the ankle lock. Cuerno ended up stopping Strong from breaking Aerostar’s ankle, and went right after strong. Cuerno helped Aerostar to the back, and we were left with Fox, Cuerno, and Strong. Strong went after Cuerno, but Cuerno started throwing flying knees at both guys. He went for another one on Strong, but Strong caught him with the ankle lock. Cuerno rolled through and sent Strong to the floor. Fox was also sent crashing to the ringside mats. Cuerno hit the Arrow of Death, causing Strong to crash to the floor. Fox climbed up to the top of the Temple and hit a flipping dive off the exit area onto Strong and Cuerno! Fox hit a 450 splash on Cuerno, but Strong pulled Fox off before he could be pinned. Fox took out Strong, Cuerno hit Thrill of the Hunt on Fox, and Fox kicked out. Cuerno went for a surfboard stretch. Fox was screaming in pain but refused to quit. Cuerno continued to beat the crap out of him. Cuerno went for another flying knee, but Fox dodged and Cuerno crashed into the top turnbuckle. Cuerno barely kicked out of a big splash from Strong, and Strong turned and ran at Fox on the opposite turnbuckle. Fox flipped over and hit a rolling senton on Cuerno and went for a top rope flipping senton on Strong, but Strong got his knees up. Fox superkicked Strong and dropped him, but Cuerno hit a kick on Fox and all three men were down. Once all three stood up, they all started an exchange of strikes, but Strong got the best of them due to his size. Fox and Cuerno dropped him with a pair of kicks. Fox and Cuerno started exchanging blows, and Fox hit a split-legged Spanish Fly -- which has to be seen to be believed. Fox hit the Fox Catcher on Cuerno and pinned him! Dante Fox and Jake Strong were the last two left. Fox took it right to Strong, but Strong was able to read his movements and hit some hard strikes. Fox used the apron and hit a 619 before hitting a shotgun dropkick off the apron. Fox crashed to the floor with a horrible thud, and both were down again. Strong ate another superkick, but Strong kicked out again. Fox went for a kick, but Strong blocked it and went for an ankle lock. Fox rolled through, but Strong caught him again when he went for a dropkick and Strong locked on the ankle lock! Fox refused to give up, and kept trying to get out of it, but Strong kept holding on. After about a minute, Fox finally tapped out. Jake Strong is the new Gift of the Gods Champion. The fans were not happy with this, and they let their displeasure be known. Strong broke Fox’s ankle after the match. Johnny Mundo was training for Matanza, and Aerostar appeared and said that he couldn’t face him alone. Aerostar said without his help, Mundo would just be another sacrifice to the gods. Drago flew in and Aerostar thanked Mundo for saving him. Drago was carrying the Gauntlet of Power and Aerostar told him to take the Gauntlet in order to defeat Matanza. Mundo felt a surge of energy and claimed he felt like a god. Drago asked Aerostar if it was a good idea, but Aerostar said time will tell. Next week, Ultima Lucha Cuatro begins.